When The Straits Times declared Indian Prime Minister Narendra Modi as "The Asian of the Year" in 2014, I wrote: "Your promise of 'Acchhe Din' or 'Better Days', which electrified Indian voters, needs to be backed by solid performance" ("An open letter to Modi, ST's Asian of the Year"; Dec 12, 2014 ). With the biggest victory in 30 years by any political party in India, Mr Modi led the Bharatiya Janata Party (BJP) to a landslide win in the 2014 elections and was sworn in as India's 15th Prime Minister on May 26, 2014. As he is almost halfway through his term, it is time to reflect on how much he has walked the talk on the promises made during his election campaign. Mr Modi has raised his profile on the global stage as a charismatic leader with his whirlwind tours to around 30 countries in a span of just two years. He has captivated the audience with remarkable oratory skills and vision on matters like foreign policy, development and investment. As per the World Economic Forum last year, he was the 10th most admired personality globally. He has used social media to build an image in a way that few other global leaders have, becoming the second most followed political leader on Twitter after United States President Barack Obama. Nationally, in the recently held state elections in north-east Assam, the BJP won and also made gains in other states. In his election manifesto, Mr Modi promised an "economic revival" through breaking the cycle of high inflation and high interest rates, prioritising job creation and opportunities for entrepreneurship. He promised to bring back credibility in the Indian government, restoring confidence domestically and internationally through consistent, long-term policies. He promised not only to spur economic growth, but also to make it stable and balanced. Foreign direct investment was to be allowed in sectors which created jobs, and also in infrastructure. Focus was on acquisition of niche technology and specialised expertise. The Make in India programme was launched in September 2014 to transform India into a global manufacturing hub. Various sectors were opened up for investments, like defence, railway and space. The regulatory policies had been relaxed to facilitate investments and ease of doing business. In 2013, India's economy was stumbling and, for the financial year ended on March 31, 2013, India's gross domestic product (GDP) grew by 5 per cent, the slowest in a decade and slowing down creation of new jobs. The value of the Indian rupee dipped to an all-time low against the US dollar, resulting in higher prices for imported goods. The spectre of a potential crisis, brought about by rising inflation and crippling budget deficits, loomed large. Youth unemployment reached an all-time high of 18.1 per cent in 2012. In the quarter ended December 2012, India's current account deficit reached a record level of 6.7 per cent of GDP. By contrast, economic growth in India accelerated in 2015 despite a double-digit decline in exports. 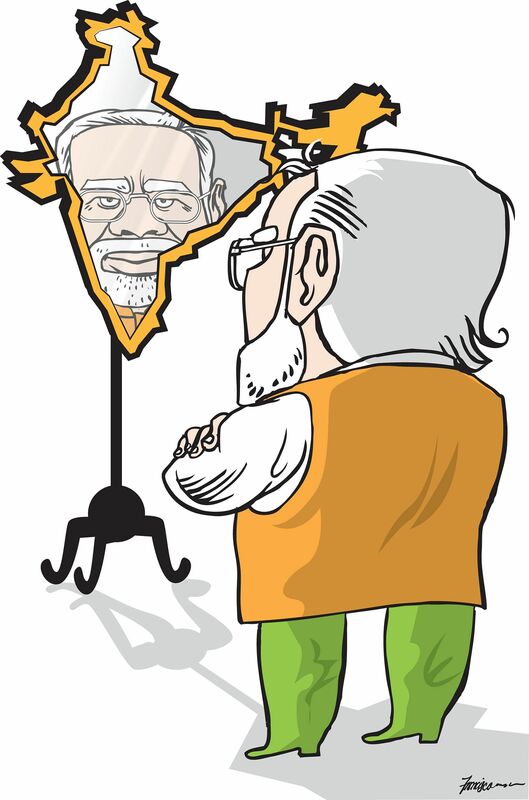 GDP growth was at 7.6 per cent in the fiscal year 2015, but growth in GDP means little if it does not result in job creation, which is the most crucial aspect of Mr Modi's electoral prospect and essential for the country's social stability. In the eight labour-intensive sectors - textiles, garments, leather, jewellery, business process outsourcing, handlooms, metals and automobiles - employment generation was 135,000 in 2015, compared with 490,000 the previous year and a much larger 1.25 million in 2009. Employment in these sectors actually declined in the last quarter of 2015. Mr Modi's promise to make India open for business fell behind. India ranks 130 out of 189 on the World Bank's Ease of Doing Business index, the worst of all the Group of 20 countries. Trade remains a problem, with US exporters to India lamenting exceedingly high tariffs and protectionist restrictions and years-long talks with the European Union all but stalled. While the government is pro-investment, it is also very restrictive about trade access, according to Mr Richard Rossow at the Centre for Strategic and International Studies in Washington. Due to its size and location, India is a natural trading partner for South Asian countries. However, agreements emanating from the South Asian Association for Regional Cooperation (SAARC), like the South Asian Preferential Trading Arrangement and the South Asian Free Trade Arrangement, have failed to break down trade barriers. Deep-seated enmity between India and Pakistan has stood in the way of broader regional cooperation in critical areas like trade and connectivity. Most SAARC countries rely heavily on developed nations as export destinations and, increasingly, import from China. In the remainder of his term, Mr Modi needs to focus on employment generation, particularly in export- oriented and agro-processing industries as well as small and medium-sized enterprises, where growth prospects are robust. Regulatory and bureaucratic impediments also need to be removed. On regional cooperation, India should lead from the front and security challenges in South Asia demand greater coordination between India and its neighbours. Some of the ongoing initiatives like the Chinese-led Bangladesh- China-India-Myanmar economic corridor and the Indian-led Bangladesh-Bhutan-India-Nepal motor vehicle agreement can open up new opportunities for closer economic cooperation and greater connectivity within the region. If the peak of the first two years of Mr Modi has been capturing the international stage, in the next three years he needs to focus on the valleys on the home front. Two of the most critical factors are employment generation and reducing income and wealth inequality. A September 2015 report by Credit Suisse reveals that the richest 1 per cent of Indians own more than 50 per cent of the country's wealth. A weakened and disorganised opposition Congress may not be good enough for BJP's chances of winning the next elections. Historically, voters have often baffled the political pundits, including the election debacle of BJP in 2004. The then incumbent BJP, with its "Shining India" hype, apparently was poised for another win, which fell flat against the stark economic reality that many ordinary Indians were facing at that time. When BJP left office the last time, the richest 10 per cent of the Indian population was almost 7.5 times as rich as the poorest 10 per cent of the population. I concluded in my article in December 2014: "Time and tide are on your side. What kind of ride you will make out of it, we Asians optimistically await to see." For Mr Modi, there is still time but the tide never waits for too long. Professor Syed Munir Khasru is chairman of international think-tank The Institute for Policy, Advocacy, and Governance, based in Bangladesh.